16th April 2019: please see this PUBLIC ANNOUNCEMENT from Melody. 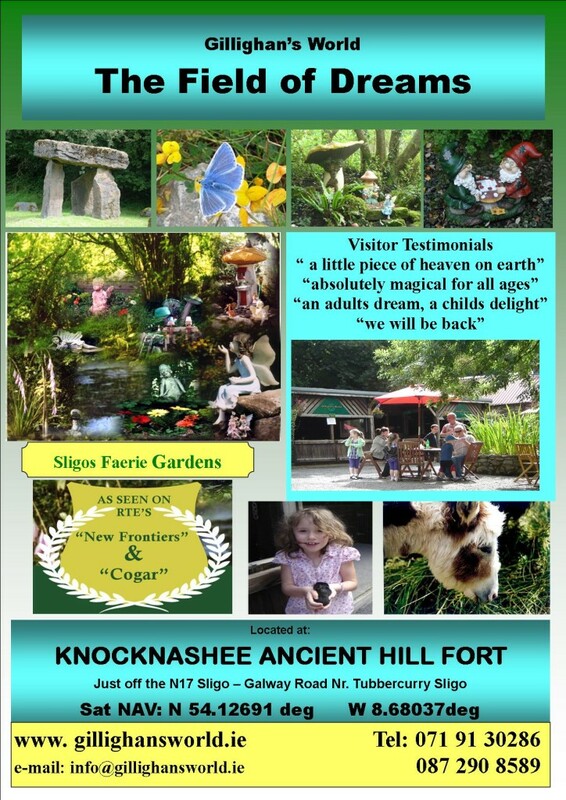 Sligo’s Enchanted Faerie Gardens are a Spiritual Experience for PEOPLE OF ALL AGES. Located at Knocknashee, one of Irelands’ ancient sacred hills, and traditionally known as ” the Hill of The Fairies” you escape into a land of artistry and imagination. It is a magical place adults adore and children love. Miniature villages and delightful faerie habitats nestle in beautiful water and botannical gardens, with a stone tunnel entrance, dolmen and amphitheatre. Enchanted glade, secluded picnic areas, pet haven, water cave and spectacular panoramic views from the Celtic Faerie Fort.